Business standard mileage rate decreases. Fourth quarter estimated tax payment for non-corporate taxpayers due January 15. Watch FUTA adjustment on year-end report. Not filing a tax return keeps statute of limitations open. Corinthian College students receive cancellation of debt relief. 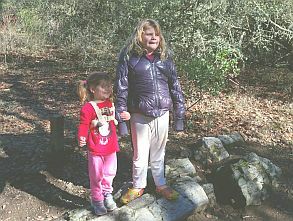 Kara and Minnie Siemer stand on a petrified tree in the petrified forest near Santa Rosa, California. The start of a new year is traditionally a time to set goals and resolutions for the coming year. If we can be of service in that process, please call us. My son in law, Dan Baker, is celebrating his birthday this month. Happy birthday Dan! The IRS has announced the standard mileage rate for 2016 decreased to 54Â¢ per mile from 57.5Â¢ per mile for 2015. The standard mileage rate for medical and moving expenses decreased to 19Â¢ per mile for 2016 from 23Â¢ per mile for 2015. Congress renewed the extensions for many expired tax breaks. We sent a separate notice with a few of the details. A correction for that notice is the rate for the alternative simplified method of computing the research credit was NOT increased from 14% to 20%. That provision was eliminated from the final legislation. If you didn't receive our notice and would like to have it, please call Dawn Siemer at 408-918-3162 and she'll send it to you. We are in the process of mailing instructions to our clients this week and next. If we prepared your tax returns last year and you haven't received instructions by January 20 or you would otherwise like to receive instructions, call Dawn Siemer at 408-918-3162. Most personal interview appointments for preparing 2015 individual income tax returns will be scheduled in February. Many clients send their information without having an interview, but if you need that personal attention, you should schedule your interview appointment now. Call Dawn Siemer Monday, Tuesday or Thursday at 408-918-3162. The final estimated tax payment for individuals and calendar-year estates and trusts is due January 15, 2016. Remember California taxpayers with taxable income of $1 million or more must pay their estimated taxes using the current year's facts. California passed a retroactive tax increase in the last election. There is no penalty for not paying the additional tax with your 2013 estimated tax payments, but you might want to do it for a deduction on your 2013 federal income tax return. Watch the alternative minimum tax. See your tax advisor. If you miss the January 15 deadline, making a late estimated tax payment can stop penalties from accruing. Remember that most 2015 annual information returns, such as W-2s and 1099s, should be issued to payees by February 1 and sent to the tax authorities by February 29. Although requirements for real estate operators to issue Forms 1099 were repealed, real estate operators that are real estate professionals should prepare them anyway. Some taxpayers who weren't concerned about qualifying as real estate professionals will want to now to avoid the Medicare tax for investment income. See your tax advisor for details. California, among other states, has a cutback in its state credit for federal unemployment taxes. That means additional payments of up to $105 per employee will be due with Form 940. Be sure this adjustment is done with your year-end report for 2015 using Form 940, Schedule A. An election is also available to treat distributions made during the first 65 days of the following year (for example, March 5, 2016) as distributed for a taxable year (for example 2015). The maximum federal income tax rate increasing to 39.6% and the 3.8% tax on net investment income hit estates and trusts especially hard. They apply when the undistributed trust income exceeds $12,300 for 2015. (The income of some trusts is automatically considered distributed. See your tax advisor.) The beneficiaries should be involved in this decision and be informed about the additional income to be reported on their income tax returns (in writing) and to avoid unpleasant surprises. The Tax Court rejected Mr. Redstone's arguments that the statute limitations had closed. The statute never started to run because no gift tax return was filed. The Tax Court also rejected the IRS's claims of negligence and fraud. Mr. Redstone had a history of filing gift tax returns and relied on the advice of a qualified tax professional when he didn't file the gift tax return for the 1974 gift. The IRS has announced that students of Corinthian College who would otherwise have had cancellation of debt income for the forgiveness of their student loans will not have to report the cancellation as taxable income. The debt was incurred as a result of fraudulent misrepresentation. Financial Insider Weekly broadcast schedule for January and February. February 5, Mark Erickson, attorney at law, "How to choose a good divorce lawyer"
February 12, Mark Erickson, attorney at law, "Child custody in divorce"
February 19 and 26, Mark Erickson, attorney at law, "Spousal support for California divorces"